TNX.net is a relative new but awesome text link ads system for both advertisers and publishers. The system seems working really well as it trades over 25.000.000 text link ads per month. Despite of the fact that TNX.net is completely free to join, which has attracted more than 24,000 webmasters using the system already. Webmasters can sell your text link ads through TNX.net as well. It will calculate ratings of each page for you and give you TNX-Points when a link is sold. You have full control to block new text link ads purchase at any time. So that you can avoid irrelevant text link ads appear on your site. After you have gained some TNX-Points, you can either use these points to purchase links from other websites, you can actually sell your TNX-Points to TNX.net Network at any time. Current rate is $0.61 for 1000 points and it will grow by 2% every week. You can also earn 12.5% commission of your referrer earned. 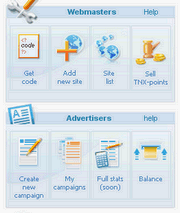 TNX.net allows advertisers purchasing non-reciprocal links from thousands of relevant websites. Instead of purchasing site-wide text link ads, TNX.net allows advertisers select any single page you want to locate your ads at. Or you just need to select the sum of text link ads, they will be placed on websites with selected PageRank, number of Yahoo backlinks on selected category automatically. The price of purchasing 1000 inbound links only cost you $1.14 at the moment which is quite bargain I think. The user interface is very good which is really easy to use. You can mange both advertiser and publisher accounts easily on one single account. And also, TNX.net claimed that there is no more than 4 text link ads are placed on each page by default, it does not look like a link farm, therefore there is no risk to get banned or penalised by search engines. TNX.net network is now offering us 2,000 TNX – Points on every new accounts. And they will credit you 5,000 TNX-Points free of charge after your website is approved. You can read more details on http://forums.digitalpoint.com/showthread.php?t=477444. Feel free to ask them questions if needed, I am sure they are happy to help you out. Someone needs a server upgrade..
What a depressing concept. This is a pure play to sell page rank and subvert the algorithms that rank sites according to relevancy. It is all about pushing up into google page 1 – if you can’t do it with content, then do it by buying (trading) rank? Any traffic that results from the links is immaterial here. So a legit site has to get dirty now, and buy otherwise nearly worthless inbound links, or sell link-space, in order to simply maintain its existing ranking? Google (Matt Cutts) explicitly warns that anyone trading links for cash, or cash equivalents, runs the risk of having their PR sunk by automated detection or manual suppression. Not that he can do a whole lot about buried PHP code that secretly spits out links that were paid, and does not mark them as such. What a soulless depressing business. All hail the almighty buck. Lets do anything, including sh*t in our own house, to accumulate more. I’ll point Matt at this site, presumably they can identify sites that use it by inspection of page source code or cross-link frequency, and then counter it. This kinda sounds similar to the recent launch of BlogRush. I think it is against Google AdSense policies to run something like this too. Justin, thanks (tnx) for a good PR you have made on Matt Catts blog! In fact, you are wrong, saying about “soulless depressing business”. We believe in making money without doing evil. See our mission: http://www.tnx.net/mission.php and Advertising policy: http://www.tnx.net/treb_adv.php. We do not accept links that could make the search relevancy worse. You didn’t get the PR from MC blog, webappers did. Since an individual link costs a fraction of a cent to place, or receive, it is clear that 99% of these links will not be verified for “search relevancy” (whatever that means) .. because to do so would cost far more in valuable time than the link brings in profit. You’re trying to provide a marketplace to BUY and SELL page rank, and attempting to obfuscate this fact because it is likely to attract the attention to google who can scare off your customers and remove your revenue overnight if they so choose. At least be honest about the slimy business model you’ve hacked together. Justin, there is nothing Google can do to identify those websites that buy or sell links via TNX system, otherwise it would be done in early 2006 when TNX conquered the Russian market. I know you hate TNX with all your guts, but c’mon man, you have to agree that TNX is kindly jerking Google, and nothing can be done about it. I use TNX myself and my website is currently at the Google’s TOP-1 by very cometitive keyword. I am not goint to tell you which one, figure it out yourself. P.S. Google is getting off track a bit. It is more likely to scare off its customers, not TNX clients and webmasters. Those like you make things even worse for Google. thanks….I will try with free… I will comment after try your free link..
TNX sounds kind of interesting. I’m slightly torn: as a web user I fear that this kind of service can distort the results a bit, but hell, results vary wildly from search engine to search engine anyway… As someone wanting to promote my website, this sounds like a bargain compared with PPC campaigns. TNX.net is an excellent program. Another similar program is Etology. I’ve been using this service for a few months now and so far I’m quite happy with the results. I haven’t had a chance to advertise with this system yet, but as a publisher I love the freedom to sell ad space based on my own prices. Check out this review that I wrote for more info. There are several alternatives to text-link-ads out there now, many of them that are not nearly as restrictive. The important thing is that you wnat to make sure publishers have the ability to decide what links are published on their sites, so they can make sure they only link to related sites that are of good overall quality.